Henri Linton is a nationally known painter and a well-respected art educator. Born in Alabama in 1944, he began painting and visiting museums as a young man. He paid for art supplies by painting signs and shining shoes. After entering a national art contest as a teenager, he won a four-year scholarship to the Columbus College of Art and Design in Ohio. Linton earned a Bachelor of Fine Arts from Boston University and a master’s degree in art from the University of Cincinnati Graduate School of Fine Arts. In 1996 and 2000, he was featured in solo shows at the Arkansas Arts Center. His work is displayed throughout the state, including in public collections at UAMS, the Winthrop Rockefeller Foundation and the Arkansas Arts Center. He has highlighted some of his works in a book he co-authored, The Art of Henri Linton: Sequences in Time and Space (2003). 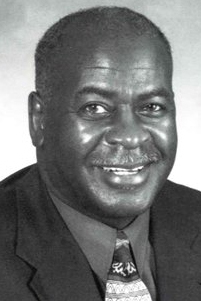 In 2001, Henri Linton was inducted into the Arkansas Black Hall of Fame. For more on Henri Linton and other inductees into the Arkansas Black Hall of Fame, visit the permanent exhibit at the Mosaic Templars Cultural Center. That museum is an agency of the Department of Arkansas Heritage.